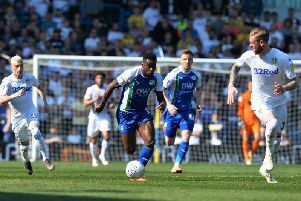 Sean Livesey: ‘Let us never speak of that again’ – That was my first reaction after leaving Deepdale a couple of weeks ago, well the first reaction that could be printed in a family newspaper that is. That, as trivial as it may seem, is probably the approach that is needed from the Latics faithful now. Things couldn’t have gone much worse in that game, and there’s no point dwelling on it now. One very poor showing and result shouldn’t take away from what a fantastic first three months of the season it has been for Paul Cook’s side. Cook will have been as disappointed as any of us with the performance at Preston and hopefully with two weeks in the bank thanks to the international break what went wrong will have been analysed, worked on and pushed out of the players’ systems ahead of the visit of West Brom on Saturday. Latics couldn’t really ask for a more difficult game to return to action in. West Brom alongside Stoke were made promotion favourites at the start of the season after their relegation from the Premier League. Despite a shaky first couple of games the Baggies are now showing the sort of form that made them favourites amongst the bookies and pundits. Darren Moore’s side have fire power all over the pitch and the lads will have to be at their best to keep out a side who have scored a startling 31 goals so far this season. With West Brom’s biggest away following in over six years set to travel up the M6 tomorrow it should make for an excellent atmosphere and hopefully the ideal environment for the lads to bounce back and put that horrible afternoon in Preston behind them. Knowing Cook as we do I’m sure he’ll have the lads well up for this one. There are injury concerns for Cook with James Vaughan and Will Grigg side lined, it will be interesting to see if he decides to push Windass in to a more central position or start with Joe Garner. Callum McManaman must also be pushing for a start after a stop start first few months back at Wigan Athletic. One man who knows more about McManaman than others is Greame Jones, it was a surprise to see him leave Belgium following the World Cup but the pull of day to day involvement in the game must have been strong. Jonesy along with Roberto is one of those rare breeds in football, someone who was both a legend as a player and then as a coach. There aren’t many people who played Division Three football for Wigan go on to win an FA Cup and come third in a World Cup. In fact I can only think of his good friend Roberto who achieved similar. His service for Wigan Athletic should never be forgotten and I still harbour hopes of the sharp football brain and deadly goalscorer from Gateshead becoming our manager one day. But that debate is certainly for another day, as nice as it will be to see Greame back at the Dave Whelan Stadium on Saturday I hope he has a miserable afternoon. Let’s put Preston behind us, remember the good so far this season and get behind the lads in noise and numbers tomorrow. Paul Middleton: International breaks are just a whole pile of nonsense. More players come back injured from games than would ever be the case for league games including, this time, our own Will Grigg. Why is that? I daresay some players don’t fancy being away from home knowing they’re not going to play, and so get “injured” quite easily. Others though, again Like Grigg, turn up every time, play a total of 10 minutes across two games and get crocked. Is it the training methods, the pitches? I’ve no idea, other than I’d be happy if international games were limited to qualifying for actual tournaments, and not some made up UEFA thing which is basically friendlies in league form. I’ve seen a total of three England games in my life, and am in no real rush to see more, if I’m honest. Managers must also be sick of the sight of players getting injured in meaningless games. They complain weekly about the long season so much that a weekend in February has been designated for a break. Will it be a break for the players though? Not if the football beancounters get their way, I’m sure. Hands up who’ll be going to Dubai to watch Man Utd versus a Sheikh Yermunnibank XI? It’s a lose-lose for fans all round. So, here we are, not really knowing if we’ll have our only proper goalscoring striker available not just this week, but for the next two or three weeks. And all so ex ‘Tic Michael O’Neill can keep wondering why he isn’t scoring eight goals a game in the seven minutes he keeps giving him. If Paul Cook has any sense, he’ll wallop Grigg in the wotsits the day before the next international break, so he can claim injury. It’s the only thing which makes sense. In Grigg’s absence, we do have Joe Garner, a man who has been underwhelming so far. It might just be a case of him needing a run of games, but we’ve seen in the last couple of matches that chances are being created which Grigg probably would have been the end of, but which have gone begging. People online, though, are screaming for Joe Gelhardt to be given a chance. Given his performances for the England U17s, it might be a good shout. Apart from the fact he’s 16, and would get eaten alive by Championship defenders who will be waiting to kick and elbow him right back to sixth form. Here’s hoping Grigg makes a Lazarus-like recovery. Without him, it’s hard to see where regular goals are coming from. Stuart Glover: This is exactly the reason we all want our clubs to play at the higher levels. Games such as these. The glamour ties. OK, with all due disrespect to them, West Bromwich may not seem like the most glamorous game. And having said that, I do not expect that they would consider Wigan to be at all glamorous either! But West Brom are a very good team. My tip to win this division this year. They certainly have started well and come to the DW in good form. Their players litter the list of league’s top scorers. We have had some good games against the Baggies over the years. I remember the October 1992 game, early on in my Latics supporting career, at Springfield Park in which we beat a good West Brom side 1-0 with a goal from on-loan Chris Makin. That was one of the first occasions on which I saw Latics beat one of the big teams. It certainly wouldn’t be the last. There was also the dramatic game at the Hawthorns in 2004 when Latics went ahead, John Filan got sent off and, I think, the last minute winner came from a corner that was not taken from the correct place. And who could forget that our first away win in the Premier League came at West Brom. Coming from behind, unlikely hero David Connolly scored to level it at the interval before Jimmy Bullard scored the winner right at the end of a tight game. What will happen this time? Who can say? Most Latics fans would probably take a point now. Unusually for me, I probably would as well. Not only are the visitors in good form, our defence has not been as good as we would have liked this season and we are probably all feeling negative following our last game at Deepdale. Also, at the time of writing, there still seems to be uncertainty over the severity of Will Grigg’s injury, which he picked up on international duty. On the other hand, the players know that they have a point to prove. They will be desperate to put right the clear wrongs from two weeks ago. We have really attacked the Championship this season and that has paid dividends both in terms of results and entertainment. Football is a simple game on paper, but on the pitch anything can happen. It will be great to see Wigan legend Graeme Jones again. The current West Brom coach scored goals for fun at Latics in years gone by and he was assistant manager under Roberto Martinez in the Premier League and for the FA Cup win. No-one will be granted legend status for scoring a winner this weekend, but hopefully someone can channel their inner Chris Makin and make a memory that someone else will remember in 26 years time.